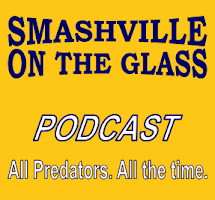 With very little to report on the Predators recently, our friends over at Illegal Curve bring something to us when they actually spoke to Preds Captain Shea Weber on their weekly podcast. Weber participated in The Goals For Dreams Charity Event and game at the The Max Bell Arena in Calgary last Saturday. Chris Mason and Colin Wilson also participated in the game. During the interview, Weber covered a wide range of topics including the player workouts in Nashville, his recent contract, the Olympics, the CBA negotiations, and the hockey scene and fans in Smashville. Go here to listen to the Illegal Curve podcast and hear the the entire interview. Do not miss tonight's Predators Pizza Party at A-Game Sports! As the lockout drags on, the Nashville Predators are having an event tonight that Preds fans do not want to miss. Gnash is hosting a very special "Pizza Party" (free of course) at 6:15 p.m. at A-Game sports at 215 Gothic Court, in Franklin. When you enter the building go to "The Turf" which is upstairs, above the the basketball courts. Over 500 folks are expected so be sure and arrive early and most of all, wear your gold and bring anything you can to be loud (Noisemakers, Thunder sticks, Cowbells, clappers, etc). This will be a once in a lifetime event that will go down in Predators history and that you want to be a part of. What does the Hal Gill signing really mean for Smashville? The Nashville Predators announced a key signing on Thursday ahead of the July 1 fiasco that will go a long way toward adding stability to the teams defensive corps for next two years. Signing Hal Gill to a two-deal deal at $2 million a year is just what the doctor ordered to stabilize a young group of blue-liners that will soon be transitioning from the known quantity of Shea Weber and Ryan Suter to whatever combination it becomes in the next few days, weeks, or years. I am assuming that Ryan Suter will be grazing on greener ice in Pittsburgh, Detroit, Minnesota or one of 26 other NHL teams that are willing to offer stupid money for a D-Man with a fair market value of seven million dollars in a reasonable economy that he has not accepted from David Poile. I, personally, am also wondering what Shea Weber is thinking when he lost the Norris Trophy to a clearly inferior candidate in Erik Karlsson that Adrian Dater claimed caused the biggest gasp in the room with the media when it was announced (truth be known, Amanda DiPaolo made a loud noise and this writer leaked an expletive, sitting beside Dater). Was Karlsson's theft of a Norris enough to drive Weber away from the friendly confines of Smashville's Bridgestone Arena in favor of a more traditional market when he becomes a free agent next year or does it lead him to a double-down (as in the Saloon) situation to prove the pundits wrong and gut it out in Music City. That is a serious question that only he can answer. The day before the award was handed out, Weber was clearly Mr. Smashville and said all the right things. Then, after the awards show he was the only Preds nominee not to face the media, so we don't know his thoughts, but I would assume (I'll make asses of you me and everyone else) that he was not pleased with the result and it could eventually lead to a relocation. Therefore, at this point, Hal Gill is the only D-man other than Ryan Ellis signed on in to the 2013-14 season and is ready and committed to stand in front of Pekka Rinne in the Predators pursuit of the 2014 Stanley Cup and that should make him a hero among the Predator faithful. Gill is a winner, and even at his age of 37, he is a player that Preds fans can rally around to lead the team forward. He is a leader on the ice, in the clubhouse, and he never fails to stand up for the team in the post game scrum. The Nashville Predators released their preseason schedule for the upcoming 2012-13 campaign and it features only a pair of home games at Bridgestone Arena while they will play five games on the road. The Preds will play the St.Louis Blues on Tuesday, September 25 and the Carolina Hurricanes on Saturday, September 29 in Smashville, with both games starting at 7 p.m. Rookie camp will open on Friday, September 14, while veterans will report a week later on the 21st. Nashville, Tenn. (June 27, 2012) – Nashville Predators President of Hockey Operations/General Manager David Poile announced today that the Predators will open their seven-game 2012 preseason schedule with a doubleheader at the BankAtlantic Center in Sunrise, Fla., for the second consecutive season on Monday, Sept. 24. Nashville’s preseason schedule includes a pair of home games: Tuesday, Sept. 25 against the Central Division rival St. Louis Blues and Saturday, Sept. 29 against the Carolina Hurricanes. Both games at Bridgestone Arena will start at 7 p.m. CT. In addition to their doubleheader against the Florida Panthers, the Predators will travel to Raleigh to take on the Hurricanes for the seventh consecutive preseason (Sept. 28) and play their first preseason tilt at the Scottrade Center since 2003 on Oct. 2. Nashville will round out the seven-game slate on Oct. 5 at the Verizon Center in Washington. The 2012-13 Nashville Predators rookie camp is scheduled to open Friday, Sept. 14, with veterans reporting on Friday, Sept. 21 for testing and physicals. The Predators’ first day on the ice will be Saturday, Sept. 22 at the Centennial Sportsplex. Season tickets for the 2012-13 Nashville Predators season in Smashville are on sale now and start at just $24 per game. Great interest-free payment plans are currently available for Full Season and Half Season packages. You can also create your own ticket plan with the Dunkin’ Donuts Flex 12 Plan by selecting 12 games that fit your personal schedule. To order tickets to the Nashville Predators, visit nashvillepredators.com/seasonticket or contact a ticket representative at 615-770-7800. Information on ticket availability for individual games will be announced later this summer. Monday Sept. 24 Florida Panthers BankAtlantic Center 1:30 p.m.
Monday Sept. 24 Florida Panthers BankAtlantic Center 6 p.m.
Tuesday Sept. 25 St. Louis Blues Bridgestone Arena 7 p.m.
Friday Sept. 28 Carolina Hurricanes RBC Center 6 p.m.
Saturday Sept. 29 Carolina Hurricanes Bridgestone Arena 7 p.m.
Tuesday Oct. 2 St. Louis Blues Scottrade Center 7 p.m.
Friday Oct. 5 Washington Capitals Verizon Center 6 p.m. 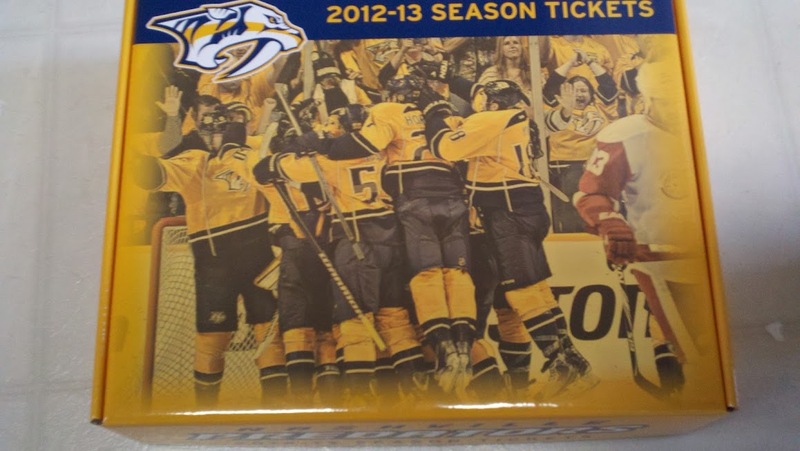 Since 1998, the Nashville Predators have tad a "tag line" or marketing slogan each year and most have been pretty good. The term "Smashville" has been the most successful and is well known throughout the hockey world. One of my favorites from the early years was "Fang Fever". The worst ever had to be the "My Town" theme based on the horrible ballad from the country act Montgomery-Gentry which allegedly brings down the house at their concerts. It did nothing but drive the Preds out of the 2006 playoffs and kill any enthusiasm that the crowd could bring forth every time it was played. As far as towns are concerned, Smashville is more "Run This Town" than "My Town" eight days a week. Anyway, we digress. Since Nashville has some of the brightest and most creative folks on the loose so the Predators are wanting each of you to come up with the coming year's slogan. Therefore they have released the #MySmashville contest that will give huge perks, including season tickets, to the person who can produce the best tag line. The Nashville Predators released the full details of this year's edition of their annual Summer Development Camp that will feature the team's top prospects as well as all nine new Preds that were drafted at last weekends NHL Entry Draft in Pittsburgh. On ice sessions will be open to the public Today, Thursday, and Saturday from 9 a.m. to noon at Centennial Sportsplex. The final day with the battle for the coveted camp trophy will be on Sunday from 2 - 4 p.m. Here is a full printable schedule as well as a printable roster of participants. Make the jump for all the other details of the camp. The video starts with a poll of reporters on what they thought of Nickelback and then moves on to more pertinent matters at hand with the Predators representation at the 2012 NHL Awards show. The Nashville Predators released the list of pending restricted free agents that they made qualifying offers to before Sunday's July first free agency period begins. Players who earned less than $660,000 in the previous season must be offered 110 percent of last season's salary. Players making up to $1 million must be offered 105 percent. Players making over $1 million must be offered 100 percent of their salary. The Preds qualified the following five players who are not arbitration eligible (2011-12 NHL base salary in parenthesis - from CapGeek.com). After trading away their own first and second round draft picks at the trade deadline, the Nashville Predators have to be pleased with the nine players that they picked up at the 2012 NHL Entry Draft on Saturday at the CONSOL Energey Center in Pittsburgh on Saturday. After sitting on the sidelines in round one on Friday night, the Preds made the most of their nine picks on day two of the draft picking up six forwards, two defenseman and a goalie. In spite of leading the league in wins, Pekka Rinne finished third in this year's Vezina Trophy balloting as Henrik Lundqvist was the clear cut winner. Jonathan Quick finished second. With the Predators riding an zero for three losing streak at the NHL Awards, Mike Fisher came through in the clutch and was awarded the NHL Foundation Award to bring hardware to Smashville. The big winner was Nashville's Room at the Inn shelter who will receive a $25,000 grant from the NHL to continue their work which Fisher supports. After having been nominated all three seasons that the GM of the Year award has been given, David Poile finished third in the voting as St Louis' Doug Armstrong took home the award. Poile actually received the second highest total of first place votes but did not garner as many second and third pace votes. For the first time ever, EA Sports turned the voting over to the fans for who would grace the cover of the NHL13 game that will be released in September. With finalists, Pekka Rinne and Claude Giroux on the stage at the Wynn Encore Theater in Las Vegas, Giroux was unveiled as the winner. No vote totals were released but it was previously announced that less than a few thousand votes separated the finalist in the final hours. After being narrowly edged out for the Norris Trophy by hockey legend Nicklas Lidstrom last year, Shea Weber was narrowly beaten by Ottawa Senators youngster Erik Karlsson. Only twelve points separated the two in another year of close voting. Zdeno Chara was a distant third, 107 points behind Weber. Ryan Suter was eighth in the voting and ex-Pred Dan Hamhuis rounded out the top ten. In celebration of the Predators' four nominees at the NHL Awards Show at the Wynn Hotel in Las Vegas, the Nashville Predators will host a viewing party at the Patron Platinum Club at Bridgestone Arena tonight starting at 4:30 p.m.
As we make way to Las Vegas for the NHL Awards Show, we have plenty of time to opine who might be grabbing the hardware on Wednesday night at the Wynn Encore Theater. I will run through the nominees for the contested awards and pick the folks I would like to see win as well as attempting to project who will actually win. I will mark my personal choices with an asterisk (*) and mark my projected winners with a (W). The definition of the award is "the goaltender adjudged to be the best at at this position" as judged by the NHL GMs. If the voting had occurred at the end of February, Henrik Lundqvist would have been the hands down winner. As it was when the voting was actually done, it was probably a wide open race and may be the closest balloting of all the awards. I would have to go with the homer pick of Pekka Rinne since the Preds wouldn't have made the playoffs without him but I think that Lundquist may have had the votes to hang on for the win. Many folks have stated that Erik Karlsson should be the winner based on the season that he had with an over-achieving Ottawa Senators team. I think Karlsson will finish a close second to the Predators' Shea Weber who will finally claim the Norris this year as a defenseman who can dominate the game at both ends of the ice. Statistically, all three nominees were in a dead heat as far as points were concerned and each appears to have the ability to improve in future seasons. Adam Henrique had his coming out party with the Devils during the playoffs but that is not a consideration for the Calder. Of the three, Gabriel Landeskog had the biggest impact on his team and will probably walk away with the trophy. With Pavel Datsyuk not on the ballot this year, the voting will be a wide open affair. Picking a clear cut winner is impossible but I think Matt Moulson may be the winner. If I were voting, I would go with Brian Campbell since it appears no other Florida Panther will pick up any prizes in Vegas and they should receive something for the season they just completed. David Backes and Patrice Bergeron both had excellent seasons but as long as Pavel Datsyuk is on the ballot, he will be the big winner and I agree and would be voting for him. I was really surprised that Barry Trotz and Kevin Dineen did not make the final three. If I had voted, I would have voted for Dineen for taking the Panthers to the playoffs with a bunch of players that had not played together previously. Paul Maclean will receive plenty of support from the Canadian broadcasters but Ken Hitchcock will have wide ranging support and bring home the bacon. John Tortorella will finish third. The Masterton is a real crap shoot this year and any of the three nominations could win. I think that Max Pacioretty will rise to the top of the ballot and haul off the trophy. The Ted Lindsay Award differs from the Hart in that it is voted on by the players themselves and goes to the "most outstanding player." I would have to vote for Evgeni Malkin again but I think the players may reward Steven Stamkos for his 60 goals by giving him the award. The Messier Leadership Award is an oddity among the trophies as it is voted on by Mark Messier himself. I have no idea who Messier will cast his vote for but in my opinion, the two best captains in the league are Dustin Brown and Shane Doan so I would split my vote between the two. 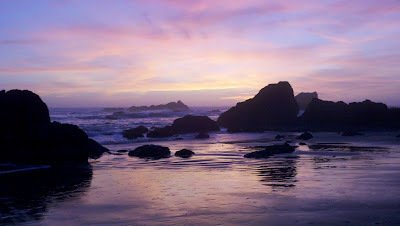 With the Kings winning the Stanley Cup, that might tip Mark's choice toward Brown, so I will project him as the winner. There is no way to pick this award as all have made major charitable contributions in their communities. In my book they are all winners but I have to take Mike Fisher as the hometown pick. From a Smashville perspective, David Poile is the GM of the Year every year and this season was no different. Since the vote was taken before the playoffs, he will finally be named the winner for bringing in Hal Gill, Paul Gaustad, Alex Radulov, and for having all the homegrown talent continuing to emerge into the NHL and helping lead the Preds into the playoffs. 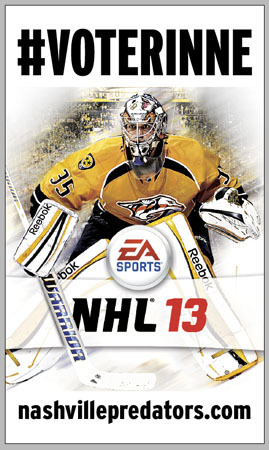 Finally, the fans of Smashville will really shine when it is announced that Pekka Rinne will grace the cover of NHL 13 when it is released in September. As we prepare to travel to Las Vegas to cover the NHL Awards, we have a pair of Predators items to mention. Early today, Dmitry Chesnokov reported that Alexander Radulov, the ex-prodigal Predator, will be returning to the KHL to play for CSKA, the Red Army Team. He has one year remaining on his KHL contract but CSKA is hoping to sign him to a two or three year extension. The threat of a lockout in the NHL in the fall weighed heavily in Radulov's decision according to the report. The other news was the announcement by the Predators that they had signed goalie prospect Magnus Hellberg to an entry level contract. Hellberg was the Preds highest pick in last summer's NHL Entry Draft in Minneapolis, when they took him in the second round with the draft's 38th pick. The 6-5, 185 pound Swede has yet to play in North America on the smaller rink but is expected to play in Milwaukee this season. Back-up Predators goalie for the last two year, Anders Lindback, will have his chance to come out from under the shadow of Vezina nominee, Pekka Rinne next season as he was traded to the Tampa Bay Lightning as part of a multi-player deal on Friday. The Predators traded Lindback, Kyle Wilson and a seventh round pick to the Bolts in exchange for two second round picks in this years NHL Entry Draft and a third rounder at next year's draft. The Preds also took on the Lightning's cast off goalie, Sebastien Caron who will become an UFA on July 1st and is not a part of Nashville's plans. The Predators were without a first or second round pick in next week's draft and this move partially filled that void and will help the team restock the cupboard with more young talent. As we prepare to gear up for our trip to Las Vegas and the NHL Awards next week, I am thrilled with the star-studded lineup of celebrity presenters for this years event. I am especially excited to see Ray Liotta (Goodfellas, Field of Dreams, Blow, Hannibal, and others) added to the list of presenters. I am also interested in asking Vince Vaughn about one of the great hockey scenes of all time in the movie "Swingers." The Nashville Predators will be well represented with their own set of stars with Pekka Rinne (Vezina, NHL13 Cover Vote), Shea Weber (Norris), Mike Fisher (NHL Foundation Award) and David Poile (GM of the Year) as finalists in their respective categories. After patiently waiting for almost four seasons for wayward Predator Alexander Radulov to make a return to Music City, the Preds are now ready to send him on his way to another NHL team or the KHL. According to Josh Cooper of the Tennessean, David Poile made it clear today that Radulov did not fit into the Predators future plans. He indicated that a trade or a release to a KHL team were both possibilities. Radulov played nine regular season games with the Preds beginning in late March and picked up thee goals and four assists. In the playoffs, Radulov had a goal and five assists in seven games. A key factor in Radulov's exit was the disruption caused when he and Andrei Kostitsyn stayed out past curfew the evening before game two of Nashville's second round series with Phoenix and the pair were subsequently suspended. It will be interesting to see what type of deal that Poile can swing in disposing of Radulov's rights. Even if your fingers have grown numb from voting for Pekka Rinne of the Nashville Predators in his race against Claude Giroux of the Philadelphia Flyers in the final vote for who gets to be on the cover of EA Sports NHL 13, today is the day when the final sacrifice is needed. Rinne has received endorsements from Carrie Underwood, Dierks Bentley, Charlie Sheen and others in his quest to win the popularity contest. The Preds have set up a special voting place today at Dunkin’ Donuts (1500 21st Ave S, Nashville) from 1:30 to 3:30 p.m.where fans can get a free donuts courtesy of Dunkin’ Donuts, the Nashville Predators and Best Buddies (subject to availability). Voting runs until 10:59 CDT tonight and the winner will be announced at the NHL Awards show at the Wynn Encore Theater on June 20, 2012. Go here to vote early and often for Pekka in the finals. According to multiple sources, the Nashville Predators avoided losing the rights to Patrick Cehlin by signing him to a three-year contract worth $525,000 per year at the NHL level. The signing took place on Thursday, just before the Preds rights were set to expire on June 1. Cehlin was a 2010, fifth round choice at the NHL Entry Draft in Los Angeles. Here is his career statistics from Elite Prospects. Cehlin appeared excited by the signing and received plenty of congratulatory salutations on his Facebook page. The Nashville Predators continue to keep their European scouts busy as they have now signed free agent forward Daniel Bång to a one-year, two-way contract. Every year, NHL Commissioner Gary Bettman uses the platform of the opening game of the Stanley Cup Finals to deliver a "State of the Union" address to the media and fans. It always provides good insight into how the league performed, business-wise, during the season, and offers a few insights into where the NHL is headed. This year's address was no different with updates on the Phoenix situation as well as other ownership issues, the Olympics in 2014, and upcoming collective bargaining with the NHLPA. The Nashville Predators continue to stockpile young defensive prospects as they announced the signing of 23 year-old Joonas Jarvinen of Finland. The 6-3, 220 pound player was signed to a two-year, two-way entry level deal this morning. This year's playoff season has been one of the most unpredictable on record with the sixth seeded New Jersey Devils and the eighth seeded Los Angeles Kings making it to a final showdown that no one would have predicted at the end of the season. Like most folks, we struggled with our predictions, going 5-3 in the opening round and 2-2 in the second round. Our 1-1 record in the Conference Finals is directly attributable to thinking the Coyotes were a team of destiny after they cruised past the Predators. Pekka Rinne of the Nashville Predators will face Claude Giroux of the Philadelphia Flyers in the final vote to who gets to don the cover of EA Sports NHL 13. Rinne got past John Tavares in the semifinal while Giroux bested Evgeni Malkin on the other side of the bracket. Voting runs until June 4 and the winner will be announced at the NHL Awards show at the Wynn Encore Theater on June 20, 2012. Go here to vote early and often for Pekka in the finals. Preds goaltender Pekka Rinne moved on to the Semifinals round of the EA Sports NHL 13 Cover Vote, edging Chicago Blackhawks forward Patrick Sharp in Round 1 and NY Rangers goaltender Henrik Lundqvist in Round 2. Voting for the Semifinal Round runs NOW through Monday, May 28. Rinne is matched-up against NY Islanders forward John Tavares in the semifinals. Philadelphia Flyers forward Claude Giroux and Pittsburgh Penguins forward Evgeni Malkin are matched head-to-head in the other semifinal. Rinne is not only the lone goaltender remaining in the field, but the lone player representing a team from the Western Conference. Winners of the two semifinals will meet in a final voting to determine the cover player for the EA Sports NHL 13 game. The winner of the cover vote campaign will be unveiled as the EA SPORTS NHL® 13 Cover Athlete at the 2012 NHL Awards™ on June 20 at the Wynn Las Vegas in Las Vegas. There is no limit to how many times fans can vote so click here to vote now and vote often! For the third season in a row, the Nashville Predators' Alexander Radulov was named the Kontinental Hockey League's Most Valuable Player (a.k.a. The Golden Stick Award) for his regular season play with Salavat Yulaev Ufa. Before joining the Predators in March, Radulov scored 25 goals and added 38 assist during the KHL regular season. In six playoff games he had six assists. After joining the Predators, Radulov had three goals and four assists in nine regular season games and then had a goal and five assists in eight Stanley Cup Playoff games. Radulov becomes a restricted free agent on July 1 and it is unclear what his plans for next season are at this time. Time is running out to vote for Predators' goalie Pekka Rinne for the cover of NHL 13 as he battles against fellow Vezina finalist, Henril Lundqvist. Go to the NHL 13 Cover voting page and register your vote. Peks needs your support to move on to the semifinal round. Also, for those in Smashville wanting to get in one last skate on the Bridgestone Arena ice, tonight is the night as the Predators are hosting an open house from 5 to 8 p.m. Go here for more details.